A stroke may occur if an embolism travels from another part of the body and lodges within an artery in the brain. 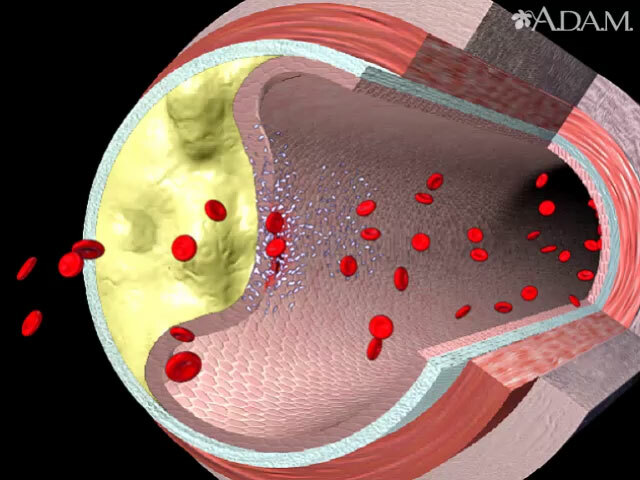 When an internal arterial wall becomes damaged, various types of emboli can form, such as one derived from platlets, thrombotic, cholesterol, or mixed. In this example, an embolism is formed in the internal carotid artery, breaks loose, travels towards the brain and lodges in a cerebral artery. The blocked artery deprives the brain of oxygen, damaging the surrounding brain tissue. The result is a stroke.